Ko Samui means Samui Island. It is part of Thailand, but sits off the southeast coast. We arrived about 9AM this morning and anchored offshore. This port does not have a dock big enough to accommodate a cruise ship, but it is a popular tourist destination. There are lovely beaches and most signs are in both English and Thai. Their main income used to be from coconuts, but now that is diminishing and the main source of income is tourism. I was feeling better today but Ray felt like he was getting my cold. He doesn't care for having to use a tender to get to a port anyway, so he stayed on-board and I took the tour "Ho Samui Highlights." After a 20 minute boat ride to shore I boarded the bus and was on my way. Our guide's name was Zen. He gave each of us a little fish made of pink ribbon on a pin for us to wear to identify us as part of his group. He explained that it is the custom in Thailand, if a couple wants children, they make a large version of this fish for each child they want and hang it outside their house to bring good luck in adding to their family. 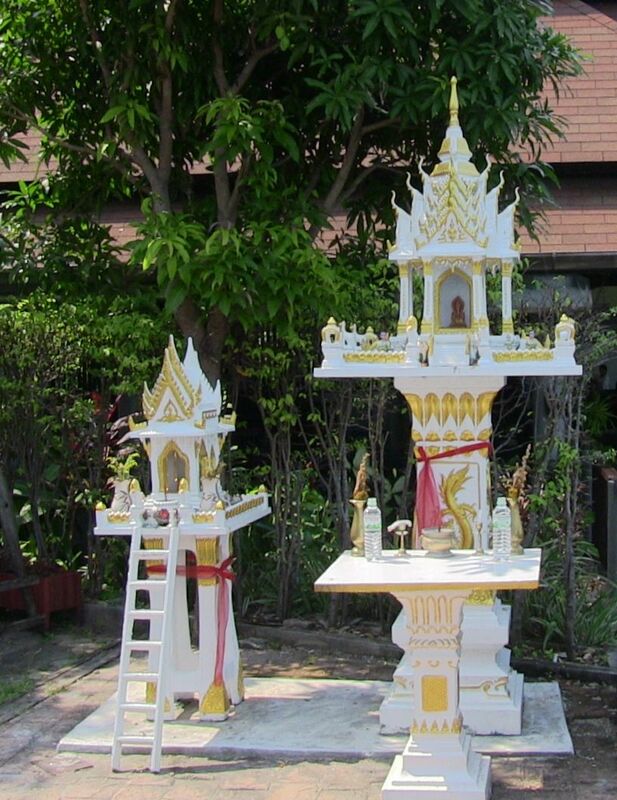 People also place "Spirit Houses" in front of their homes or businesses to keep evil spirits away. The traditional ones are on a pedestal like the one on the left here. Only one is required, but it seems many businesses place a smaller one with a ladder to invite the spirits in next to the main one. We saw these all over the island. Our tour took a circle road around the island. The first stop was at the Young Elephant Show at Island Safari. 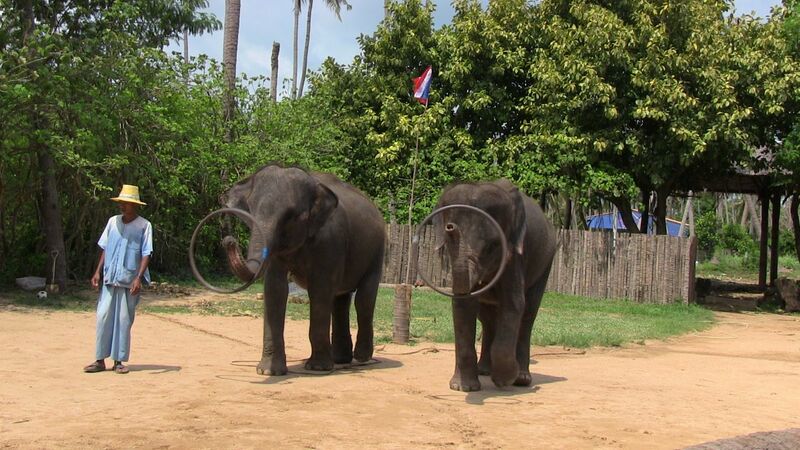 Elephants used to be used here to help with logging, but logging in the forests is no longer allowed. Also, there are no elephants in the wild here anymore, all elephants here are "domestic." Two young elephants performed various tricks for us, including giving "massages" to several volunteers. 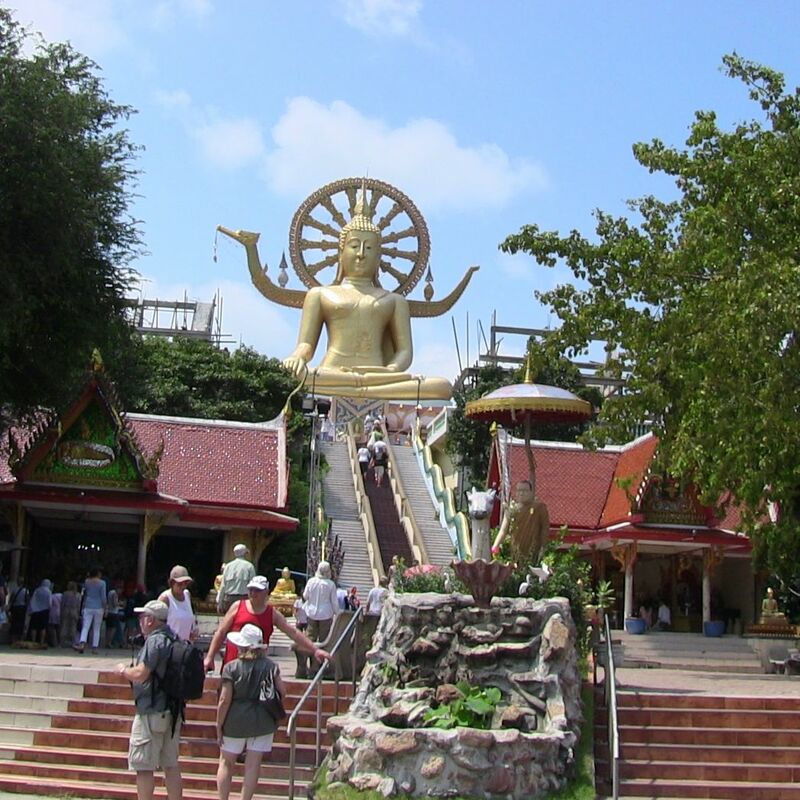 Our second stop was to see "Big Buddha", a 12 meter (about 39 ft) statue at the top of 72 steps. I decided not to climb the steps, but did explore the surrounding market. We drove up to a high point along the beach next and stopped at a local restaurant for soft drinks and a bio break. There was also a lovely view of the water and rocky coast below. The next stop was at a Coconut plantation where we got a demonstration of how monkeys are trained to climb up tall coconut palms and pick ripe coconuts. 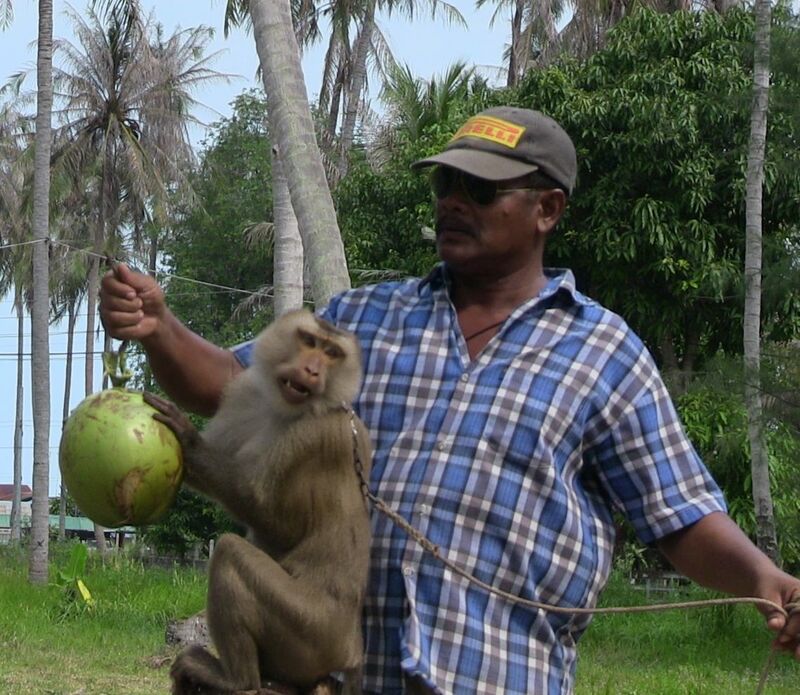 The monkeys are first taught to roll the coconuts between their legs to separate the coconut from it's stem. Then they are taught how it distinguish a ripe coconut by feeling it's shell. Once the have learned these lessons, they are sent up the tree to pick the coconuts. We made one last stop before going back to the pier. 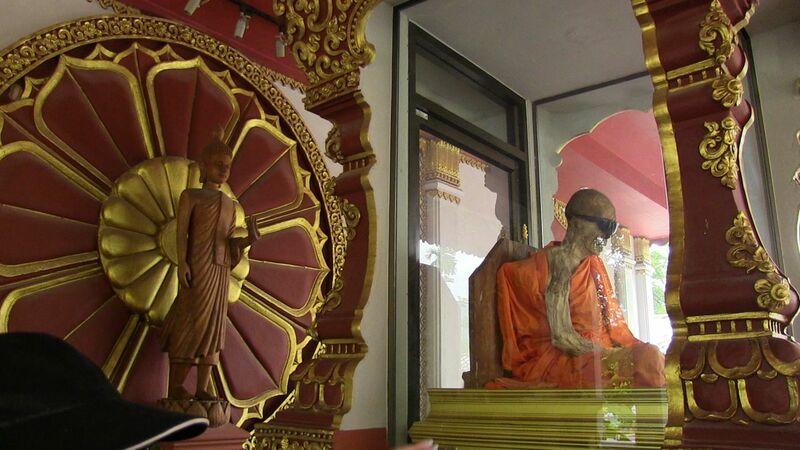 This was to visit the Kunaram Temple, where the petrified body of Ko Samui's most famous monk is on display in a specially designed box. It was a slow ride back to the ship on the tender. The boat was filled to capacity and the waves were rocking. Tonight is Block Party night were we get to meet our new neighbors who joined in Singapore, as well as share a glass of wine with some who have been on the ship with us on prior segments as well. I like this Regent tradition.